This program titled “Breakthrough Many-Core Processing Using the Altera Cyclone FPGA to Accelerate Your Embedded System” will be webcast on July 25, 2012, at 1:00 PM EDT. To register visit the element14 login/registration page. Five Webinar attendees are eligible to win a free copy of David Pellerin’s textbook, “Practical FPGA Programming in C” pictured above. This entry was posted on Thursday, July 19th, 2012 at 12:01 am	and is filed under code, FPGA, talks. You can follow any responses to this entry through the RSS 2.0 feed. You can skip to the end and leave a response. Pinging is currently not allowed. I detest webinars – I never get to see them. I’m usually stuck at work, or (like this one) it’s scheduled for 0230AM Australian CST time. For Buddha’s sake – just post it on Youtube and send me a link! Yup, “Webinar” that you can’t view after the fact without giving them a lot of personal information. Fail! When are the Marketing Goons gonna learn? Indeed, why have something ‘live’ these days. Really. I never watch live television, you can grab everything from the channel’s website these days, with less ads too. Ah well. C programming for FPGA’s sounds useless though. Why would you want to do that? 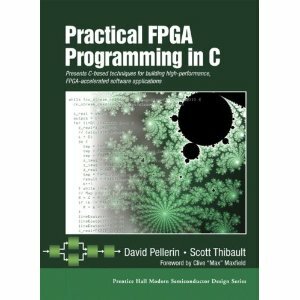 Program a soft proccesor in it and you can program C. Use the FPGA where it’s really powerful for; parallel computations in hardware. all webinars are designed to be interactive, but if you have more then 20ppl the interactivity is not usable .. so that’s why simple yt video is usually better way to handle things … then make a forum topic to discuss it if clarification is required. 1. I want USB. Preferably High Speed. USB PHY isn’t support by an FPGA chip. 3. How best to take advantage of the microcontroller in my USB interface choice?